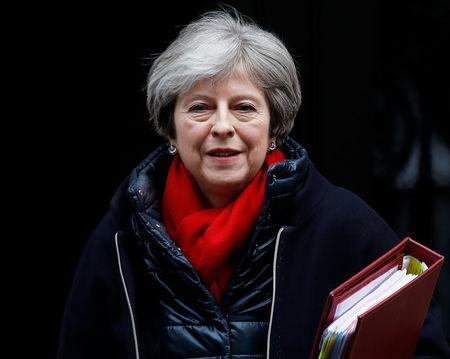 LONDON (Reuters) - Prime Minister Theresa May will attempt to unite her feuding cabinet and convince a sceptical European Union that Britain knows what it wants from Brexit in a series of speeches over the next few weeks. May's government will aim to address that in a series of six speeches by the prime minister and other senior ministers in the next few weeks, which her office dubbed "The Road to Brexit". “Brexit is a defining moment in the history of our nation," a source in May's office said. A BMG poll on Sunday for the Independent showed 74 percent of Britons were unclear about May's overall Brexit strategy. As well as facing pressure from Brussels, May also needs to unite a cabinet and Conservative party, still deeply split between those who voted for Brexit in 2016 and those who didn't, behind a single vision for Britain's future outside the European Union. May's first speech, to be delivered at a conference in Munich next Saturday, will set out the security relationship Britain wants with the EU. She will deliver another setting out Britain's future partnership, although a date for that has yet to be confirmed. Foreign minister Boris Johnson, a leading Brexit advocate, will begin the 'Road to Brexit' series with a speech on Wednesday, described by May's office as a "rallying cry to those on both sides of the Brexit debate". Chancellor Philip Hammond, seen as the most pro-EU member of May's cabinet, will not give a speech. May's authority on Brexit, already weakened after a failed gamble on a snap election last year, has been further damaged by ideological splits between ministers, exacerbating concerns that Brexit talks may fail and the government collapse. Conservative lawmaker and prominent critic of May's EU exit strategy, Anna Soubry, warned on Sunday that the type of Brexit the government was seeking did not have majority support in parliament, which will get a say on the final exit deal. Last week, Japanese businesses warned May that they would have to leave Britain if trade barriers after Brexit made them unprofitable.